· under go similar chemical reactions. Substances that are neither acidic nor basic, such as water, are said to be neutral. 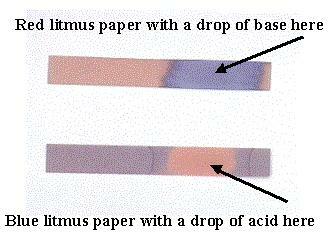 To identify a substance as an acid, a base, or neutral, an indicator is used. It changes color according to the type of substance it is put into. Indicators can be solids, such as litmus paper, or universal indicator (which change color over a wide pH range can identify many different substances and is more precise), or they can be liquids. such as phenol red. A universal indicator is used to measure pH. · Acids and bases react together when they are mixed. · This type of reaction is called neutralization. · Both the acid and the base are used up in this type of reaction. · A salt and water are produced. · Acid in your stomach has a normal pH of 2. · This acid helps in the digestion of food and kills off bacteria. · If you eat too quickly, or are under stress, your stomach produces an excess amount of gastric acid (giving you heartburn). · Rainwater is naturally slightly acidic. · When this water combines with chemicals in the atmosphere such as sulfur dioxide or nitrogen dioxide, the effect results in Acid Rain (with a pH as low as 3 - in some parts of Canada). · This can have devastating effects on living organisms. · To neutralize this acid rain, lime (calcium hydroxide - which is a base) is added to lakes. · This is not necessary in Alberta because the mountains contain rich deposits of limestone, making the water naturally basic. · When the acid rain falls, it is neutralized almost immediately.